In Colombia, Afro-descendant communities and peasants from La Alsacia, La Reserva Barbas de Mono and La Reserva Maklenkes have been participating in the CCRI since 2016, representing diverse territories, ecosystems and livelihoods. The Afro-descendant people of La Alsacia lives in the southwest of the country, on the western cordillera in the department of Cauca. They are organised as a Community Council—a form of internal administration created through Article 5 of Law 70, which recognises collective land ownership and seeks to protect the identity and rights of black communities as an ethnic group . They have suffered multiple forced displacements in their history, so they lodged an appeal under this law to obtain their collective property land title. They inhabit and protect a mountainous area of land, measuring approximately 1,088 ha, of which 600 ha are for conservation. The communities of the Los Maklenkes and Barbas de Mono reserves are on the other side of the country, on the eastern mountain range in the department of Santander. Their reserves are 12 and 55 ha respectively, but surrounding them are self-declared family reserves of up to 113 ha, all belonging to the Colectivo de Reservas Campesinas y Comunitarias de Santander (a participatory process to conserve the Andean forest started in 2008 by communities with the support of Fundaexpresión). These community organisations are peasants and, unlike the Afro-descendant community in La Alsacia, they have no special rights. They are organised into community action boards or collectives, managing community aqueducts and reserves for example. Los Maklenkes is very close to the fourth most populous city in the country, Bucaramanga, and feels the impacts of tourism. Barbas de Mono is located in a rural area that was severely affected by the armed conflict up until a few years ago. 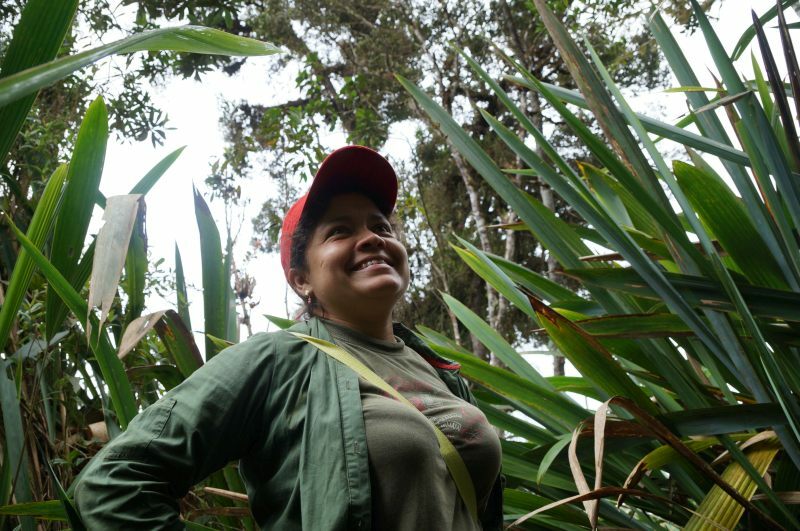 In Colombia, decades of armed conflict have seriously impacted communities and their capacity to conserve their territories. The most common reaction has been the displacement and abandonment of territories, and Colombia has more internally displaced persons that any other country (7.4 million in 2016). Parents have restricted the places that children and young people can travel to, and there are problems with anti-personnel mines in some places. All this has contributed to a loss of knowledge about territories. This is a fundamental problem, as it is difficult to appreciate and defend something not well known. All the communities have been aware of the CCRI assessment process since its inception in 2014, and they agreed to participate representing communities with similar experiences and challenges. In 2016 a national workshop emphasised the relationship between megaprojects and their impacts on the communities’ territories, highlighting the role of community conservation initiatives. 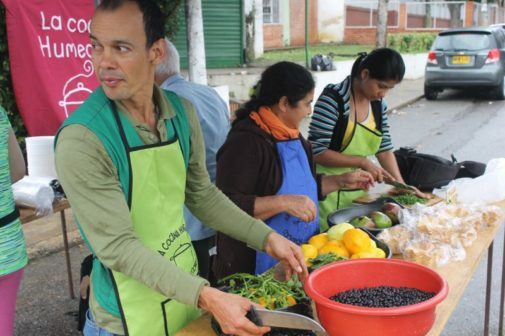 The communities also met and exchanged their various reflections and advances at the Festival of Rural and Urban Expressions in Bucaramanga in September 2017. The dynamics and contribution of the proposed national coordination body, as outlined in the CCRI methodology, was vital . This group of people—the project advisors—come from different areas of knowledge and activities, interpreting the communities’ thinking and practices, and orienting or providing reflections that are then taken back to the communities and other bodies. Taking gender concerns into account, both in terms of principles and methodologies, and prioritising the participation of all groups within the communities, methodologies were developed that reflected the cultural practices of each population, to promote the participation of girls, boys, young people and women. To facilitate the participation of women some activities were carried out in their homes. In Barbas de Mono community, women participated the most, they spent a considerable amount of time analysing their role and fundamental contributions, and considering the perceptions women have about their communities’ needs and opportunities. A strategy to vacate territories on the part of the government and other actors with diverse interests. A loss of collective memory and an ignorance of history, which among other things, may lead to an ignorance of their own culture and the adoption of foreign ones. The armed conflict and its actors, whatever their origin. Political instability has involved threats to black, peasant and indigenous leaders and communities; clashes between armed groups, including the armed forces of the state; restrictions on mobility within the territories; and either forced displacements or the confinement of the population in the hamlets, both of which have been experienced in La Alsacia. The current peace agreement signed between the government and the current FARC political party is welcomed but the situation remains fragile and makes community management of the territory very difficult. They are pleased that the conflict has receded but are now concerned about what may happen to the conservation area within the context of the peace agreement with the FARC, because the armed conflict previously prevented access to the area and stopped its exploitation by third parties. Also, there are still armed confrontations near the village, and several communities have been subject to new threats. This is a common experience in Colombia, and disputes over land, mainly in afro-descendant territories, are intensified by the rapid expansion of oil palm monocultures. The community near the Los Maklenkes reserve observed that one of the reasons why they are such a cohesive and resilient community is because of the way they have stayed together in the times of crisis and conflict they have had to endure. Rather than abandon their territory, losing their lives’ work and their means of survival, they chose the highly risky strategy of sending delegates to negotiate with armed actors so that they could remain. The greatest impact of the CCRI in Santander has been to encourage leaders to think about strengthening their community conservation processes, and to create an understand that this is not about preservation, but about promoting opportunities for more families to benefit from and enjoy nature. In processes that are complementary to the CCRI, both communities have defined their biodiversity monitoring objectives (as has the community in La Alsacia), and within the CCRI they undertook activities to understand and demonstrate the positive impact of community conservation actions. In Los Maklenkes, identification and monitoring of threatened and endangered birds protected in the peasant reserve area is being undertaken. In Barbas de Mono, bird diversity in agricultural areas is being compared with that within the reserve. The CCRI’s gender-based approach fostered internal observations in the communities, one of which identified the limited participation of women in community processes and activities as one of the main threats to its resilience. The inhabitants close to Los Maklenkes observed that patriarchy restricts women’s access to various activities and community processes, such as the Community Action Boards. This situation is largely determined by men, who decide which spaces or activities their partners and/or daughters may take part in. As part of their CCRI initiative the community chose to study their local fauna through the traditional practice of embroidery which is culturally associated with women. However the men and the children took it up as well, helping to redress the gender imbalance. After representatives of the two communities met, the community in La Alsacia also embarked on an embroidery project, which proved so popular that the majority of families in the community are now aware of the CCRI project, with the active participation of children and their parents. An educational system that distances children from their territory and the rural way of life, to the detriment of popular knowledge and traditions. 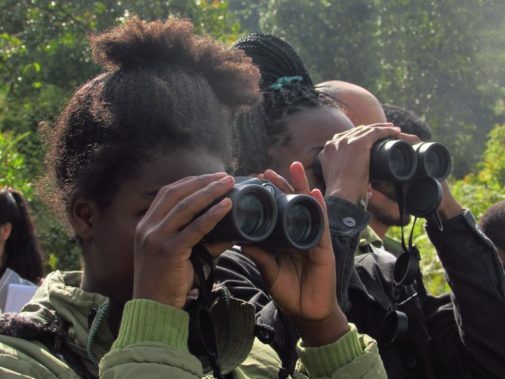 Finally, there is a repeated experience of the interests and needs of the communities being ignored, by urban policy-makers, by large conservation organisations and even by entities supposedly supporting grassroots processes. The community management and conservation approach is very different to the model imposed by the state and large conservation NGOs. It is not about buying and isolating portions of land, but considering the people linked to the process and their knowledge, culture and skills, as well as land and physical space. There is a high risk for community initiatives when essential aspects of the communities’ resilience, such as autonomy and self-management, are pushed aside to give greater importance to the role of external actors. Such ‘assistance’ can create dependence that weakens the communities’ basic processes. It is important to prioritise territorial management initiatives that have emerged from the communities. They have legitimacy, a greater probability of permanence, and benefit both human populations and ecosystems. Successful community conservation is based on effective organisation, with broad participation and ownership, where autonomy and community organisation is the priority, and other aspects, such as legal norms, are seen as being complementary rather than the priority. Projects or proposals for advocacy in communities must always be created and agreed upon by them; never devised and imposed from outside the territory. Processes should not be detached from wider contexts either. Community management strategies should provide spaces for dialogue, reflection and debate within civil society, and between the people and the state. The community with the highest risk of expulsion from its territory identified their capacity to organise, recognise and value the community as an extended family—that must stay together and mobilise together in an autonmous way—as being key to resilience. These elements can be strengthened through their own educational processes, which they can implement themselves. Popular education was recommended as an important strategy generally, including in relation to respect for people’s rights and state policies. This would help the communities to recover part of the assets they have lost, and identify what has been or is being imposed on them. In this sense, the peasant way of life is relaimed as a reason for pride and an option for a dignified life. Encouraging productive strategies associated with community management and conservation spaces is critical to the communities’ resilience. This includes dismantling the paradigm created by official systems of protected areas, which treats conservation and the presence of local communities and their productive activities as being mutually exclusive. Agroecology and community management of forests are alternative frames of reference that guarantee a successful political approach that takes territorial and organisational dimensions into account. In the Los Maklenkes reserve, for example, productive activities compatible with the care of the natural heritage within the reserve include the use of non-timber forest products and the propagation of orchids. In Barbas de Monas the community decided that keeping bees would be a productive activity that is good for biodiversity and would bring the community together—there are now hives managed by families and others that are managed by the community as a whole. Women peasant leaders who carry out productive practices in forests and agroecosystems recommended combining long-term activities, such as timber production, with those that provide short-term results. This is to awaken and maintain interest in long-term components, as well as responding to the pressing needs of families. Including recreational or sharing activities is important too. Meetings or assemblies do not have to be limited to a political or organisational dimension. They can promote well-being by considering other perspectives which are usually not allocated enough time. Problems and their solutions can be prioritised, while still leaving time for ‘Buen y Bien Vivir’ (Good Living and Well Living). From a legal perspective, it is imperative to review gaps in legislation, ‘pending’ legislation, and state obligations relating to the rights and claims of Indigenous Peoples, Afro-descendant and local communities. For example, after 24 years, the Presidency has recognised a delay in the implementation of Chapters IV, V and VII of Law 70 of 1993, which deals with “rights of land use, protection of natural resources and the environment; mining resources in the territories of Afro-Colombian communities and on economic and social development respectively”. It is important that the state ensures that the necessary conditions are in place to ensure that these rights can actually be enjoyed, and people can remain in their territories. For example, among the communities that took part in the CCRI, the one that has suffered the most in terms of threats and pressure to leave their territory is the Afro-descendant one. This is the only community out of the three that actually has legal status recognising their rights in the territory. Suitable strategies should encourage the participation of a greater number of families in the conservation and community management process, and make the processes and initiatives of community conservation, sovereignty and productive autonomy more visible. Paola’s motivation stems from her roots within the territory and her community. She believes that solutions must come from the community itself as this creates innovative teachings which will reach and influence everyone, whilst making the most of the fact that they are a small population. She feels threatened by the proximity of a rural municipal area where ex-FARC combatants are settled. These people say that they will become part of the region, but without adopting or knowledge of the internal regulations of the Community Council, which may have a variety of negative impacts and affect the territory’s conservation area. Colombia is dividided administratively into 33 geographic and economic regions. 32 of these are departments governed from their respective capital city. The other corresponds to the capital district of Bogota. Congreso de Colombia. 1993. Ley 70 de 1993. [pdf] Available at: http://www.acnur.org/t3/fileadmin/Documentos/BDL/2006/4404.pdf [Accessed 11 August 2017]. UNHCR. 2017. Tendencias Globales sobre refugiados y otras personas de interés del ACNUR. Available at: http://www.acnur.org/recursos/estadisticas/ [Accedido 27 marzo de 2018]. Natural Justice and Global Forest Coalition. 2014. Methodology of the community conservation resilience initiative. [pdf] Available at: https://globalforestcoalition.org/wp-content/uploads/2014/06/New-Last-CCR-Initiative-methodology_May-2014.pdf [Accessed 10 August 2017]. ATI, 2014. Trampas de REDD y de otros proyectos de conservación de bosques, http://censat.org/es/publicaciones/trampas-de-redd-y-de-otros-proyectos-de-conservacion-de-bosques [accessed 12 April 2018[. Lovera-Bilderbeek, A. S. E., 2017. Agents, Assumptions and Motivations behind REDD+. UvA-DARE, University of Amsterdam. 242 pp. CONPES. 2017. Lineamientos de política y programa nacional de pago por servicios ambientales para la construcción de paz. [pdf] Available at: https://colaboracion.dnp.gov.co/CDT/Conpes/Econ%C3%B3micos/3886.pdf [Accedido 18 enero de 2018]. Presidencia de Colombia. 2017. Decreto 870 de 2017. [pdf] Available at: http://es.presidencia.gov.co/normativa/normativa/DECRETO%20870%20DEL%2025%20DE%20MAYO%20DE%202017.pdf [Accedido 18 enero de 2018].Rodriguez, G. 2010. La consulta previa con pueblos indígenas y comunidades afrodescendientes en colombia. Bogotá D.C.
 Verdad Abierta. 2018. Rearmados de toda clase amedrantan a los indígenas de Suárez. [online] Available at: https://verdadabierta.com/rearmados-de-toda-clase-amedrantan-a-los-indigenas-de-suarez/ [Accedido 21 febrero de 2018]. La Silla Vacía. 2013. El café, la primera semilla de la reelección. Available at: http://lasillavacia.com/historia/el-cafe-la-primera-semilla-de-la-reeleccion-41383. [Accedido 02 febrero de 2018]. Presidencia de Colombia. 2015. ¿porqué el Gobierno no reglamenta el capitulo 6 y 7 de la ley 70 de 1993? Eso ayudaria en la solución de la pobreza afro. [online] Available at: http://www.urnadecristal.gov.co/pregunta/porqu-gobierno-no-reglamenta-capitulo-6-y-7-de-ley-70-de-1993-eso-ayudaria-en-soluci-n-de [Accessed 11 August 2017].